Celine graduated from North Brisbane College of Advanced Education in 1980 with a Diploma in Community Recreation. She worked as a Recreation Officer in a variety of positions in resorts, nursing homes and child related services. This included YMCA, National Fitness, PCYC, local councils and welfare organisations, such as Centacare, where she coordinated Outside School Hours Care programs for school aged children. After completing further studies in early childhood, Celine spent many years employed as a group leader in child care centres and as a school officer in the preparatory year level at Marymount Primary School on the Gold Coast. In 1997, after having three daughters, Celine then became self employed as proprietor and senior administrator in her family electrical contracting business. In 2012, we were very fortunate that Celine joined our team to head up Active Rehab at Hope Island. She is loved by our team and the patients alike. Celine has a mature, caring, highly efficient and organized approach to her work. 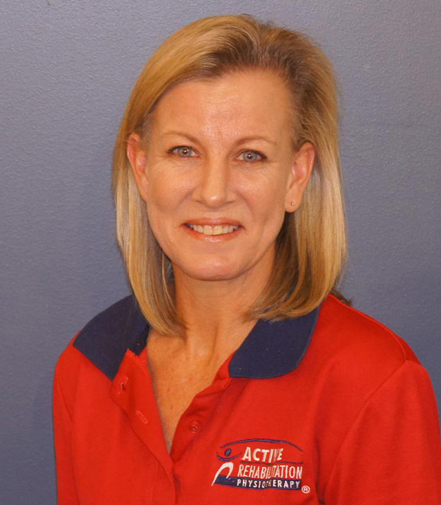 She is the senior receptionist and administrator of Active Rehab at Hope Island, as well as having a role in assisting with administration across all of our Active Rehab locations. Celine enjoys the beach, bushwalking and spending quality time with her daughters. She has always enjoyed an active lifestyle. She represented Queensland in the National Titles for athletics and has been in representative teams for netball, touch football and indoor cricket.